Just because many standard photos of Yorkies show the long hair and top knot (tied with a bow) doesn’t mean that that’s the only acceptable coat style. It’s not. In fact, any clean, brushed Yorkie is a cutie. But the long coat and the puppy cut are the two most popular coat styles. The long coat is the style you typically see in breed books and on many Yorkie Web sites. It’s also the standard style at dog shows. The reason the long coat is so ubiquitous is the Yorkshire Terrier coat is one of the defining characteristics of the breed. Its color, texture, and length are outlined in the breed standard — as is the preferred coiffure (the single or double top knot). As cute as a shorter cut is, it doesn’t show off the coat to best advantage. Achieving the long, silky coat takes dedication and care. Your Yorkie supplies the coat, which, like human hair, continues to grow. Everything else — the daily brushing, the weekly shampooing and conditioning, the wrapping it up to keep it off the ground, and more — is up to you. If you fail to do these tasks religiously, then that beautiful coat ends up a tangled mess. Wrapping your Yorkie’s coat (that is, winding the ends around folded papers and securing them with a band) is a task you don’t really need to do unless you’re aiming for a coat suitable for the show ring. If you are trying to grow a show coat, then keep your dog in wraps 24/7 and take the wraps out only for the show ring. Wrapping protects the coat, allows it to grow, and helps keep it clean — especially important for male dogs, who get urine on themselves. Start wrapping as soon as the hair is long enough, usually when the dog is 9 to 10 months old. The top knot and bow are musts. You can choose between a single bow right in the middle or two bows on either side of a straight part. If your Yorkie’s coat is soft instead of silky, you may not be able to achieve the look you want. Soft hair mats more, is more difficult to keep clean, and breaks more easily. The sheer work of grooming a soft coat to the breed standard probably isn’t worth the trouble. You may have to resign yourself to a shorter cut. If you plan to show your Yorkie, keep him in the traditional long coat. It’s part of the breed standard. The alternative to a long coat is obviously a short coat. One of the more popular short coat styles is the puppy cut. Look at a Yorkie puppy, and you get a pretty good idea what that style is. Essentially for a puppy cut, you (or a professional groomer) trim the coat into short layers all over the body and around the face, as shown in Figure 1. 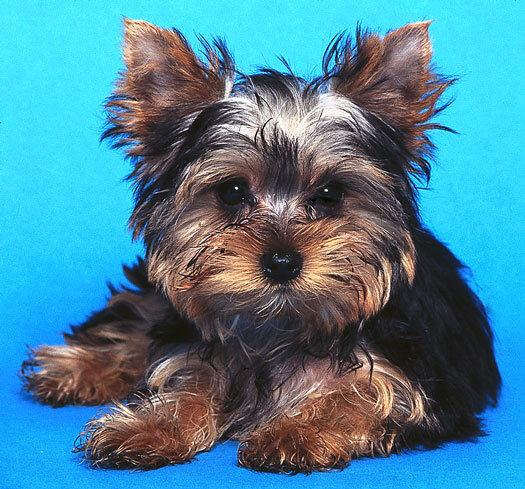 Figure 1: The coat on a Yorkie pup is short and layered all over the body and face. Other short-style options include the modified Schnauzer cut, where the coat is trimmed short on the torso and left longer on the legs, and the face is trimmed in the traditional Schnauzer mustache, or the modified Westie cut, which is similar to the modified Schnauzer cut except that the hair on the head and face is trimmed to frame the face. Shorter cuts mean less time grooming. If you love everything about Yorkies except for the grooming chores, go with a shorter cut. You’ll probably need a professional groomer to achieve the look you want. Although you can certainly do the work yourself, trimming a dog takes quite a bit of skill, the right equipment (clippers with blades of various sizes), and a practiced technique. Unless you want to learn how to do it yourself and can stand your Yorkie looking a little (or a lot) rough around the edges until your skill improves, hire a professional. A short cut doesn’t get you entirely off the grooming hook. You still need to groom your Yorkie regularly. Of course, everything’s relative: Regularly with a short cut is a lot less frequent and time intensive than regularly with a long cut. Giving her a quick brush every day or every other day, a bath about every week, and a trip to the groomer once every month or two is fine. What you gain in ease of care, you lose in the traditional Yorkie appearance. These short cuts cut the blue part of the coat right off. If you plan to show your Yorkie, go with the long coat; see the preceding section. Save the short cut for when her showing days are over.